The sun was shining to make it a gorgeous day for Fiona’s baptism photography at Our Lady of Loreto and St Winefride’s in Kew. The Roman Catholic church’s light, bright interior was a fantastic backdrop for christening photography, and I enjoyed shooting some of the church’s details before the guest of honour arrived and the service began. With her cherubic curls and pretty white dress, Fiona was an adorable subject and clearly the apple of her daddy’s eye. 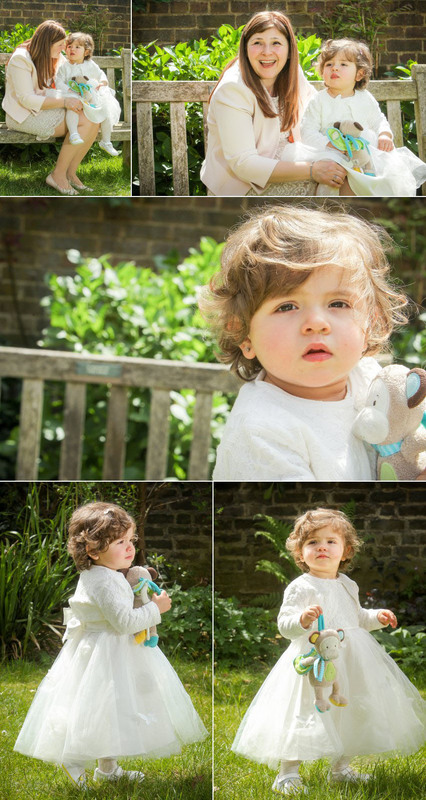 However, while her parents were relaxed and happy to have some family photos taken in the garden, Fiona was not quite as keen. It took much distraction from her parents and her favourite monkey toy to get her smiling again, but the wait was more than worth it. Once we reached the church, she sat on the steps and posed like an angel, and these photos are possibly my favourite of the entire day. There is never any point trying to rush photos when there are children involved – they will do what they want, when they want! I leave the grumpy shots in the selection for parents to decide if they wish to include any in their baptism photo album. Some do, allowing the album to be an honest record of the day, warts and all, while others may think they see enough of their child’s unhappy face in the course of everyday life and would prefer just to have the happier images to display. 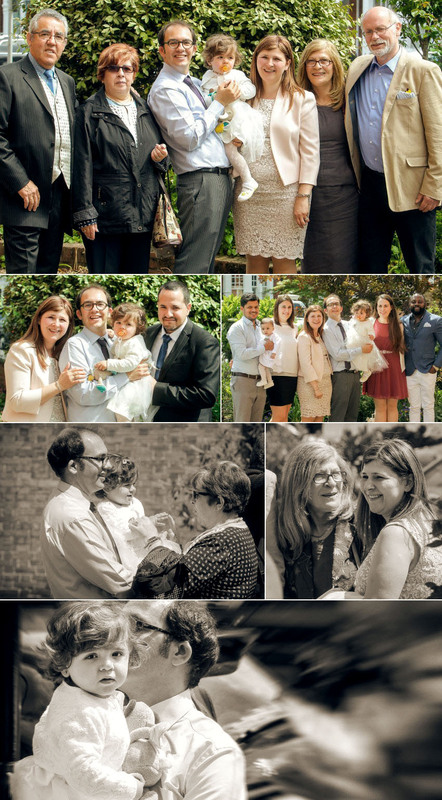 The choice is entirely personal and my role as a baptism photographer is to ensure parents have the option to decide. The sunshine continued and I took the opportunity of the church’s gardens to get some photos of Fiona with her grandparents and godparents. As is so often the case with toddlers, the relaxed, candid shots were easier to take than the posed ones, and I was able to get some pictures of a smiling Fiona before we made our way into the cooler interior of the church. Our Lady of Loreto and St Winefride’s is just over 100 years old and a wonderful example of its type. Instead of the intricate and colourful gothic revival style favoured by the Victorians, the Edwardian building has clean, simple lines and lots of natural light. The curved wall around the baptismal font was a lovely feature, as was the shaft of light that illuminated it from above. The plain white interior of the church was an ideal setting for group photos. After finishing those shots, we walked to a nearby bridge where Fiona sat through more pictures with her family and friends, uncomplaining because she was sound asleep! The nap obviously did her good because she was all smiles again at lunch to celebrate her christening and it was a pleasure to take more pictures of this lovely family. It was a delight to meet Fiona and her parents G. and D. and I thank them for allowing me to record Fiona’s special day. 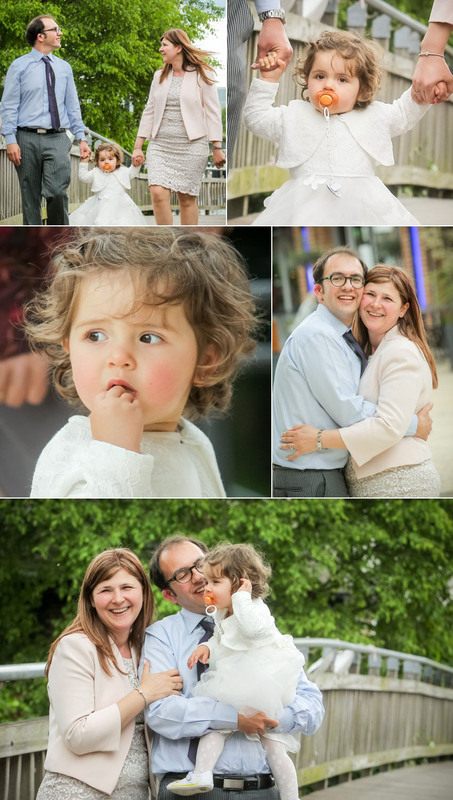 Life is like christening photography – sometimes smiles and sometimes tears – but with such affection from her family and godparents, I am sure Fiona will always know how much she is loved.